ArtsVision can customize your implementation so your data works for you the way you need. Whether we design custom reports for you, or interface with your existing systems, we can help you achieve the efficiency across your organization you are looking for. Building upon the standard functionality included in ArtsVision you can choose to further develop your implementation with additional modules and services. iCalendar (iCal) format is a standard for calendar data exchange. An AV iCal Feed enables an application to publish Date and Time based data via the iCal standard to an external calendar application. By subscribing to AV iCal feeds your users can view the up-to-date status of your calendaring and scheduling information. An easy and efficient way to share details of your calendar events within your organization. ArtsVision’s iCal feed is a web based subscription open to anyone you provide access. iCal feeds are compatibale with all standard calendar applications including Outlook, iPhone,Android,Google, Apple iCal and other web based calendar services. 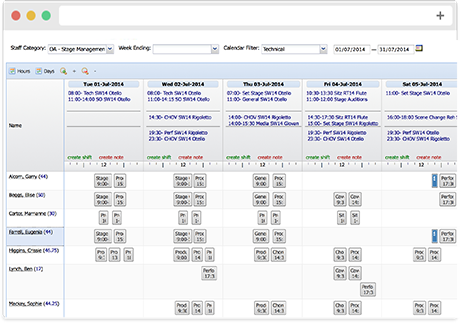 Use ArtsVision’s Staff Scheduling Module to schedule all of your Crew into work shifts, assign to already established events and track detailed time and attendance. With visually pleasing formatting it is easy to schedule your staff, calculate their assigned hours, and quickly determine remaining staffing needs and conflicts. AV Analytics is integrated directly into ArtsVision. 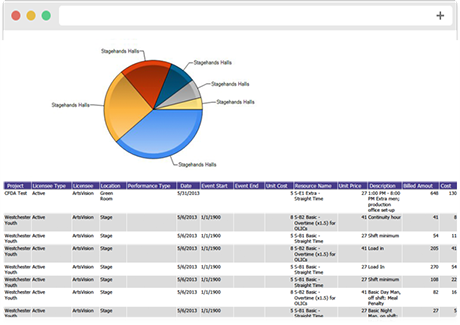 Users have access to reports from within the application; administrators have control over creating and designing views. Views can be accessed from anywhere using an HTML enabled device, and we are always there to help with training and support. Use ArtsVision to inform annual budgets, sales forecasts and track cash flow and payments. Through Resource Administration you have the ability to maintain accurate records of all of your resources, create various price lists for equipment and labor and create various scenarios for the allocation of resources to future projects. Through Data Services we can interface ArtsVision with virtually any other application or data source you use including websites, financial, ticketing, budgeting, CRM and more. Whether through RESTful, XML feed, or flat file export ArtsVision gives you the ability to integrate and synch your data to all of your existing systems. Every member of the ArtsVision team has extensive experience in the performing arts. Having worked at many of the world’s top performing arts organizations – in administration, software development, product management, sales, marketing, operations, finance, resource management, and planning – we understand your needs.